Overview - Millions of fans agree - no one makes animated mayhem like crackpot inventor Wallace and his faithful dog, Gromit. Join the Oscar - winning sensations for four madcap adventures in their cheesiest, breeziest and funniest collection yet! Hang on for an out-of-this-world ride as Wallace's mad craving for cheese leads to a space rocket adventure in "A Grand Day Out." In "The Wrong Trousers," Gromit smells something fishy after a penguin moves in and plots to make off with Wallace's Techno-Trousers. Then it's time for "A Close Shave" as Wallace & Gromit get wrapped up in a sheep-rustling scheme. Finally, trouble rises after Wallace & Gromit start a bread- baking business and are ensnared in a murder mystery that becomes... "A Matter Of Loaf And Death!" CGI has a firm strangle hold on the majority of animated features we see today, so it's easy to forget those little gems of yesterday. Hand-drawn animation is still around here and there, but not as frequently for feature films. Stop motion, with the exception of the recent 'Coraline' has all but gone extinct. Claymation is fast becoming a lost art. 'Wallace and Gromit' offers some of the most famous claymation to date. It's good to see it given a new life in HD. Since this kind of work is so rare nowadays, it's nice to know it's being preserved. The 'Wallace and Gromit Complete Collection' presents four hilarious animated tales of the wacky inventor Wallace and his smart, newspaper reading dog, Gromit. Wallace is always cooking up a new invention that inevitably gets them both into trouble. Gromit must constantly save the day. 'Wallace and Gromit the Complete Collection' contains four light-hearted animated films, about a half-hour each, that make full use of the magic of the medium. There's just something about it that lends a sort of realism to the cartoon action. It gives the films a certain depth that just can't be achieved any other way. After seeing my first claymation film as a kid, I went about trying to create my own little stop-motion film; just a tiny blue ball of Play-Dough that continually changed shapes. Nowadays, I must credit 'Wallace and Gromit' for fueling my passion for animation in all its forms. The four episodes offered here are "A Grand Day Out," "The Wrong Trousers," "A Close Shave," and "A Matter of Loaf and Death." While "A Grand Day Out" is a little rough around the edges in its storytelling (what exactly is that thing that they meet on the moon? ), it's fun nonetheless. "The Wrong Trousers," arguably the most famous of all 'Wallace and Gromit' episodes is also my favorite. Making use of ambient sound and a stellar soundtrack, the episode has little in the way of dialogue since Wallace is asleep for most of it. Yet no words are needed to explain the rift between Gromit and the new penguin that's just moved into rent the spare (his!) bedroom. The episode builds suspense perfectly. When Gromit catches a quick glance from the menacing penguin, chords of music blare. Although there's no expression on the penguin's face, we just know he's up to no good. Each and every episode has its charms. You know what you're getting when you purchase this title. 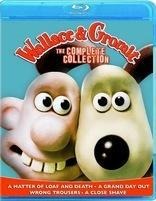 'Wallace and Gromit' is a wonderful cartoon collection that has a ton to offer the HD world with its debut on Blu-ray. Each of the four episodes is given the 1080p/AVC encode treatment. With each of them presented in their original aspect ratios you'll be able to see how the series has progressed over the years. The first two episodes "A Grand Day Out," and "The Wrong Trousers," are presented in a 1.33:1 aspect ratio. "A Close Shave" is presented in a 1.66:1 aspect ratio. Rounding out the set is the last episodes "A Matter of Loaf and Death," that's presented in the widescreen ratio of 1.78:1. "A Grand Day Out," while solid looking, does appear a little older than the other episodes. The color is just a tad dimmer. It's also slightly more grainy. Still the fine detail is immediately noticeable in the first episode. When you can see the fingerprints on the actual claymation figures you know you're getting a greatly detailed picture. "A Close Shave," and "The Wrong Trousers" both look terrific. The same fingerprints are noticeable here, but the colors are vibrant and the detail is even finer. Every thread and stitch is noticeable in the fabrics that are used to create the world of 'Wallace and Gromit.' "A Matter of Loaf and Death" does harbor a bit of aliasing, but that's about the only technical anomaly that can be found on the set. There are actually quite a few choices in the way of audio on this release. You can go with a 2.0 or 5.1 Dolby Digital offering, or bump your way up to the 5.1 LPCM soundtrack. The 5.1 LPCM soundtrack is the way to go. The range is far greater than its Dolby Digital counterpart. I was actually more amazed at how this collection sounded than how the visuals were presented. Barring some muffled dialogue from Wallace, the rest of the audio track on each episode is engrossing. The musical scores are enveloping using the surround channels to create a omnipresent feeling. LFE is more generous than I ever thought it could be, but it never feels overtly forced. Panning effects work smoothly for the most part as objects and people travel across the screen. Directionality is also well done. This is all around a pleasantly surprising audio offering. A few trailers are included at the beginning of the film before you get the menu. One for 'Thomas the Engine,' and another for the 'Shaun of the Sheep' series. Audio Commentaries - All four films have audio commentaries provided by Nick Park and his crew. A wealth of information about the design of the show and how difficult it is to do claymation is presented. Each of the commentaries holds a variety of anecdotes. Each of the commentaries are must listen material. How they Donut: The Making of "A Matter of Loaf and Death" (SD, 20 min) - This is a standard making-of documentary, but it does cover, in depth, the way the final episode was animated. I find it fascinating watching animators play with the sculptures moving them ever so slightly into another position. This documentary really brings to light how difficult and time consuming this kind of animation really is. "A Close Shave" How It Was Done (SD, 5 min) - Like the making for "A Matter of Loaf and Death" this shorter featurette covers some of the animators secrets of achieving certain effects within the film. Inside the Wrong Trousers (SD, 24 min) - Nick Park introduces us to Wallace and Gromit and shows us some of his old sketches of the characters. He also walks us through animating the toast sequence from "The Wrong Trousers" episode when the toast flips up in the air and the jam is squirted onto it. Fascinating stuff. The Amazing Adventures of Wallace and Gromit (SD, 15 min) - A short history of the characters and the show and a look at what has made the series such a global hit. Scrapbook - A few stills of the show's production and also some blue-prints for some of Wallace's inventions. Cracking Contraptions (SD, 25 min) - This is a bevy of short cartoons that highlight Wallace's crazy inventions. Shaun the Sheep (HD, 7 min) Shaun the sheep originally debuted in the episode "A Close Shave." He soon got his own series, because he's just so darn cute. This is just a small helping of that series. Game Demo - As I don't have a Blu-ray enabled PC I cannot access this game demo, but if you do have a blu-ray drive on your computer you can try out the 'Wallace and Gromit' video game. 'Wallace and Gromit' is an animated treasure that has been handled perfectly in its Blu-ray debut. Fans of the series should be proud of what this show accomplishes in the HD format. With its loveable characters, zany storylines, and its stimulating animation this collection comes highly recommended.